The following teaching focus areas provide activities and ideas for teaching skills in the 'My Community' Curriculum. The fundamental goal of any early intervention programme is to assist young learners in their preparation for more inclusive life experiences, as they grow older. The following teaching focus areas provide activities and ideas for teaching skills in the 'My School' Curriculum. All children from young learn from other people in a variety of settings and in a variety of ways. Typical children appear to effortlessly move from one environment to another, and appear excited and enthusiastic about school. For young children with autism, learning in a school environment can be a significant challenge. EIP is often the first learning environment outside of a secure and predictable home context. Our job at EIP is to make the journey through pre-school less daunting. By working on core skills we can teach a child with autism HOW TO LEARN, in a fun, safe and organised environment. We will focus on the people and activities associated with school in the teaching focus areas. The following teaching focus areas provide activities and ideas for teaching skills in the 'Water' Curriculum. Our interaction with water occurs everyday. Whether we are drinking water, using it to bathe, or looking at animals float on water in a pond - water is something we see, feel, taste, and hear! Many young children with autism are attracted to the visual aspects of water. Playing with water can be a pleasant joint attention routine. Teaching water safety and swimming skills can lead to independent leisure pursuits later in life. The 'Water' theme teaching focus areas aim to cover a young child's experience with water. The following teaching focus areas provide activities and ideas for teaching skills in the 'Let's Have Fun' Curriculum. All typically developing children learn diverse and complex skills through play. Play activities can be used to engage a child emotionally and foster interpersonal interaction. If symbolic play can be taught, it may aid conceptual and cognitive ability and improve opportunities to socially engage with others. Teaching play skills helps to prepare our children for leisure skills later in life. We will focus on understanding toys and functional sequences related to play in the teaching focus areas. The following teaching focus areas provide activities and ideas for teaching skills in the 'Zoo' Curriculum. Photos: Singapore Zoo Scenes "What?" Photos: Singapore Zoo Scenes "Where?" Photos: Singapore Zoo Scenes "Who?" Children with autism have many different interests and obsessions. Amongst these often is a strong interest in different types of animals! Almost every child in Singapore will have visited the Singapore Zoo...and most, many times! The zoo allows our children to observe and interact with animals in a safe and exciting way. We will focus on understanding zoo animals, and functional sequences related to going to the zoo in the teaching focus areas. The following teaching focus areas provide activities and ideas for teaching skills in the 'Transportation' Curriculum! Activity: Transport Theme - 50 Activity Ideas! Transportation is an important part of the way we live our lives. On a daily basis we need to negotiate travel in cars, buses, trains, airplanes, motorbikes and more! Young children with autism are often very attracted to the predictable nature of transportation. Buses and trains follow the same route and have the same operations each time with tickets, bells and stops. Early play with cars and trains often involves spinning of wheels. As imagination develops, children will learn to play-act their experiences with transport. As our children get older they will need to learn to use a variety of forms of transport. This is an important life skill. We will focus on understanding different forms of transportation and the functional sequences around using transport in the teaching focus areas. There is a series of 6 curriculum themes. Each theme is designed to cover a minimum 1 term duration. Within each theme there are a number of teaching focus areas. These areas are representative of the typical experiences of a preschool child. Goals contained in each child's IEP are taught within these contexts. Each teaching focus area consists of a skills and activity description guide. Additional materials, worksheets, photos and activities are included for teachers to download at their leisure! The WeCAN EIP Thematic Curriculum Series provides a framework for matching teaching steps to the child's learning ability. When children learn at their ability level, they have more success in understanding, doing and applying what they have learnt. Our goals is to help the young child with autism to become more aware of himself, others, and the learning environment. Children with autism are taught skills according to their individualised education plan (IEP). The WeCAN EIP Preschool Curriculum provides a context to teach IEP goals in a meaningful way. The Thematic Curriculum Series consists of 6 separate themes that have been designed to appeal to young children with autism. Young children with autism will differ from their peers in a variety of ways. They may present with stronger rote abilities and be able to complete jigsaws and do colouring with ease. However, because of their autism they are likely to have difficulties in key areas such as communication, play, organisation and learning in a group. The task for the inclusion teacher is to recognise her student's strengths and weaknesses and provide learning supports to make learning an enjoyable and successful experience. The EIP Inclusion Support Manual provides an overview and examples of autism supports for the EIP classroom context. Successful inclusion is dependent on a WHOLE SCHOOL commitment to an inclusive curriculum. Inclusion Best Practices focuses on supporting the young child with autism to feel safe, secure, and successful within the mainstream learning context. At the preschool level, there are a number of generic strategies and supports that are appropriate for almost all young children with autism. Teachers may download the ARC(S) EIP Inclusion Support Manual which explains 'How to' implement strategies with lots of practical application photo examples! 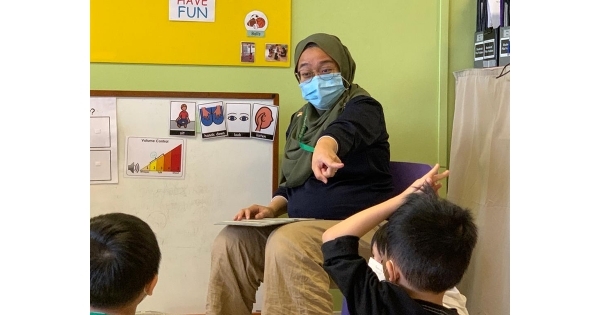 Intervention services for young children with autism in SIngapore generally encompass a variety of autism-specific approaches to teaching various skills e.g. Structured Teaching, ABA, Floortime, Hanen, RDI. There is also a focus on remediating specific deficits in speech, language & communication, social skills, occupational skills (play and activity) and motor / sensory integration issues. Most of the intervention for pre-school years appears to take place either in private settings or through specialised early intervention programmes. The majority of intervention tends to be 1:1, with limited group programmes available for different levels and ages of children. In Singapore, Blending Approaches is commonly undertaken within early intervention programmes and in special education. Because of the wide variation in the presentation of autism needs, it is unlikely that one intervention approach will benefit all children equally. Substantial research shows that specific treatments may be successful in achieving certain short-term goals, but may not on their own address all the complex learning needs of a child with autism as he/she grows and changes. In our experience, focusing exclusively on one approach or method of instruction, which might temporarily produce a result, could ultimately restrict a child's growth in other areas such as learning in a group, generalising skills, or developing skills in the 'hidden curriculum' (non-academic areas). Guidance for selection of alternative treatments is important, given the considerable family commitment and cost involved in many treatments. There is no standard treatment for autism. When selecting approaches to use to teach children with autism, the approaches must match the student's assessed needs - which may change over time. At ARC(S), we recognise that children with autism display highly individualised learning styles and needs. As such we believe NO ONE method or approach will suit all children. An individualised and comprehensive autism learning profile is the key to prescribing the 'best' approach or methodology for teaching priority skills. In Singapore, there are many treatments and approaches that aim to facilitate improvement in different symptoms or features of autism. Research suggests that Behaviour-Based Approaches provide 'better' and more reliable outcomes. Alternative Treatment Approaches are not as well-researched or proven to improve symptoms of autism, but appear to be popular in this very diverse population. It is important that teachers familiarise themselves with the facts regarding various treatments and approaches. Dr Patricia Howlin discusses and compares a variety of treatment approaches in her NAS presentation "Assessing the effectiveness of early intervention programmes for young children with autism" (2005) available on the NAS website http://www.nas.org.uk. The skilled autism teacher will develop a personal resource kit for teaching young children with autism. Teaching young children with autism in a group-learning context requires systematic planning. Individuals with autism are often described as "visual learners" or "visual thinkers". The goal of visual supports is to provide supports to learning that make sense to the young child with autism. Visual supports can be used for a variety of learning situations, such as supporting understanding, scaffolding expression and reducing distractions. Visual supports are viewed as a prompt that may be faded or reduced as the child becomes more successful in his environment, although some children may need such support for longer than others. There is a wide array of visual supports that can be used in the home, at school, and in the community. The ARC(S) Visual Supports Manual is a practical reference for the classroom teacher on how to incorporate visually structured teaching strategies into learning situations. In preparing for 1:1 direct teaching sessions, teachers are required to link information from various sources to decide 'What' and "How' to teach. The fundamental goal of direct teaching is creating and repeatedly practicing personally meaningful learning experiences across learning areas. Joint attention is the key. Working with family carers and other members of the team ensures consistency of approach and reinforcement of goals and methods. A direct teaching session can be a very 'intense' social experience for a young child with autism.